Millions of visitors during weeks of Oktoberfest. Oktoberfest is a 16-18 day festival is being celebrated since 1810, and is an important part of the Bavarian culture. It all began as a celebration to mark the wedding of Prince Ludwig (who later became King Ludwig I) and Princess Therese of Saxony-Hildburghausen. Horse races were a part of the closing ceremony of this grand event and since then, this festival has been celebrated every year.The huge fields in Munich that served as the venue of the royal celebrations are called 'Theresienwiese' in honour of the Crown Princess. Check out this guide to plan your perfect getaway to Munich. WHAT HAPPENS DURING THIS FESTIVAL? The celebrations begin with a parade through the streets of the city, followed by the tapping of the beer barrel by the Mayor. That is an official sign for the revelries to begin. You can also witness a colourful parade on the second day, in which different traditions and regions of Germany as well as other European countries are represented. Now, beer and Bavaria go way back in time and there are numerous breweries in the city as well as in the surrounding area. So, you can expect to see a number of tents, each belonging to a specific brewery, waiting for you to enter and join in the celebrations! Outside the tents, you can enjoy the fun fair ; take rides, play games, try out some food and drinks,etc. 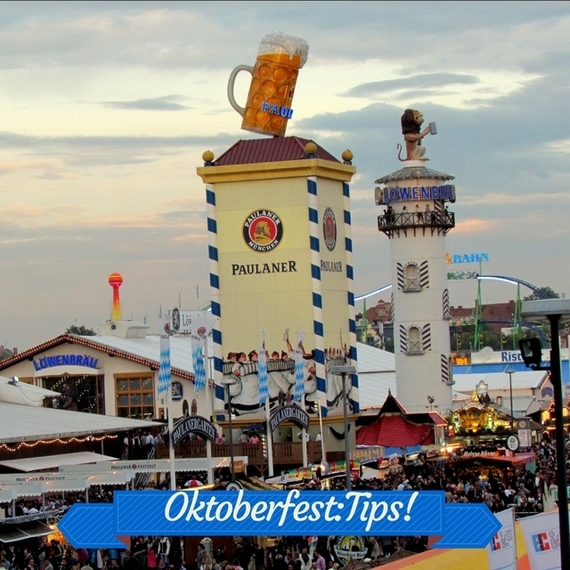 Read my tips for attending the Oktoberfest here. WHAT SHOULD I KEEP IN MIND WHILE ATTENDING OKTOBERFEST? -Be prepared for huge queues in front of the tents, especially if you are going for the opening weekend. There is no guarantee of when you would get the chance to enter. You do have the option of reserving seats online. Otherwise, going early on a weekday is a safer bet. -If you'd like to dress the local way, consider getting a Dirndl(girls) or a Lederhosen(boys). While a new attire may cost you anything between 49 and 200 Euros, you can sometimes find cheaper ones in stores or online. In Munich, you will find plenty of costumes being sold in and around the central station too. You also have the possibility of renting a costume for a day, though it might not be cheaper. Some options I found are : Bavarian Outfitters and Lederhosen Verleih or forums like 'The Local','Toytown Germany', etc. Read more festival hacks for Oktoberfest and Carnivals here. WHERE SHOULD I STAY DURING OKTOBERFEST IN MUNICH? Remember that Oktoberfest is attended by at least 6 million people in all! As a result, hotels are booked several months in advance.If you like comfort and wellness, I'd recommend checking out The Westin Grand Munich, which I absolutely loved on my last visit.It is located in the Bogenhausen area, next to the Sheraton Hotel, and has a U4 metro access which takes 10 minutes to the Central Station and 13 minutes to Theresienweise, the Oktoberfest venue. You can also try Couchsurfing ,AirBnb and hostels though. If you'd like to stay near many of the tourist attractions, you can look up accommodation options near Altstadt or Marienplatz. Hostel lovers can check out places like Smart Stay Hostel,Jaeger's Munich or 4 you Hostel & Hotel for instance. In case you are unable to enter a tent, don't worry too much. Stroll around the grounds,enjoy the atmosphere and you can also buy the Oktoberfest beer and hats right outside the grounds! Also, for those who might prefer a quieter alternative to Oktoberfest, there is always the Volksfest in Stuttgart you can attend! So, stay safe and have fun! If you have any more questions or would like to get tips for Germany,Switzerland or Europe in general, get in touch via my blog at www.europediaries.com .